Since 1941 Clarke has worked hard to make Australian kitchens and laundries more appealing and more functional areas of your home. And their hard work is paying off. Sixty plus years later Clarke are still a prominent feature in Australian homes and one of the country's largest suppliers of kitchen sinks and laundry tubs. Clark products cater to your busy life like no other. 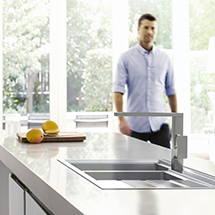 Their kitchen sinks boast smooth, clean lines, clever design features and a choice of smart accessories to help make food preparation and cleaning up easier. Whatever your culinary needs, kitchen size or style, you'll find the perfect sink for your home. Clark's wide range of laundry tubs are tough, rust and stain resistant and designed to handle whatever washing you throw into them. Clark laundry tubs provide plenty of storage space and are built to last thanks to their durable rust proof Permacoat® steel construction. It's the perfect solution for a functional and tidy laundry regardless of its size. And with a wide range of aesthetically pleasing and intelligently designed styles and sizes to choose from, you're bound to find the ideal look for both your kitchen and your laundry.